A Successful NYC Veteran Candidate Workshop! 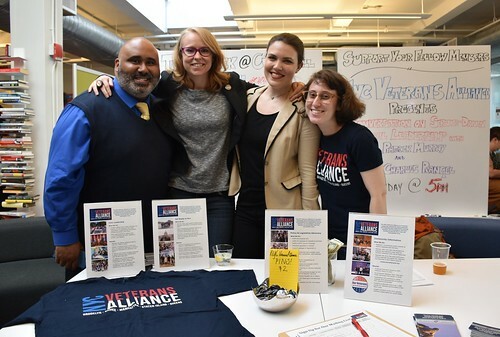 On April 29-30, we hosted more than 30 veterans and spouses at the first-ever NYC Veteran Candidate Workshop at Civic Hall, an intensive training event that included guest speakers, panels, and interactive conversations and activities with political and communications professionals and current and former elected officials. This was an empowering weekend, full of information and hands on practice, that has left me feeling more confident about success in the political arena. I feel more likely to be successful after this weekend. This class is a great tool for veterans and I will recommend it to other veterans looking to run. It reemphasized that politics is a marathon. The preparation and attention of office comes with the character on brings. I'm excited to take my turn. It has made my desire to run even stronger. It was very informative and enjoyable. Excellent presentations with knowledgeable/interesting experts. I appreciated the honesty that the speakers and panelists were willing to share. I enjoyed how the workshop covered a well-thought detailed spectrum on how to run a campaign. Having enough time to talk to other experts and one another allowed us to build bonds and discuss issues amongst one another. Take a look at our entire photo gallery from this fantastic weekend!